The Law Office of Hammad S. Matin, P.A. has traffic attorneys that handle criminal defense matters throughout La Plata, MD, including traffic tickets for speeding, running a red light or stop sign, texting while driving or using a handheld cell phone, or failing to comply with the Maryland Vehicle Emissions Inspection Program. 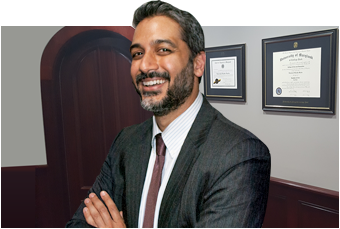 Our law office is committed to providing the best legal advice and defense available for any charge and achieving a positive outcome or minimizing any negative consequences. Conviction for a traffic violation can lead to suspension or loss of your license, a dramatic increase in your insurance rates, significant fines and even jail time. Our La Plata & Waldorf traffic violation lawyers offer legal aid to help you. In La Plata, Maryland, traffic violations may be characterized as “payable” or “must appear.” In a “must appear” violation, such as DUI, a trial date is set automatically. If you are issued a “payable” traffic citation, you have three options – pay the fine, request a waiver hearing, or request a trial date. You must do one of these three things within 30 days of receiving the citation, or you risk having your license suspended. If you request a waiver hearing, you will have the opportunity to appear before a judge with a traffic ticket lawyer and explain your side of the story, and you may be able to have the fine reduced or waived. At trial, you can have a traffic attorney defend you against the charges brought against you and perhaps have the case dismissed or be found not guilty of the violation. Having a traffic lawyer represent you and provide legal advice will help you win your case. Convictions for traffic violations are sent to the Motor Vehicle Administration (MVA), which assigns points to your license for the violation. Depending upon the violation, you may have anywhere from one point to 12 points added to your license for a violation. For instance, speeding may only put one or two points on your license, but driving with a suspended license or a DUI can put 12 points on your license. Your license can be suspended at 8 points and revoked at 12. Before either of these actions are taken, you are entitled to a hearing, but you must request this hearing within ten days of receiving the notice of suspension or revocation. You could even be subject to suspension or revocation with less points if MVA considers you to be an unfit or unsafe driver. As a law firm devoted exclusively to criminal defense, our La Plata & Waldorf traffic violations lawyers are in court every day fighting for the rights of the accused. We know the law and trial procedure and can navigate the system in search of the best possible outcome in your case. Our office also appears regularly at MVA hearings involving suspensions or revocations due to traffic violations and the accumulation of points on a license. If you have received a traffic citation, the worst thing you can do is ignore it. Contact the Law Office of Hammad S. Matin, P.A. to find out how we can help.